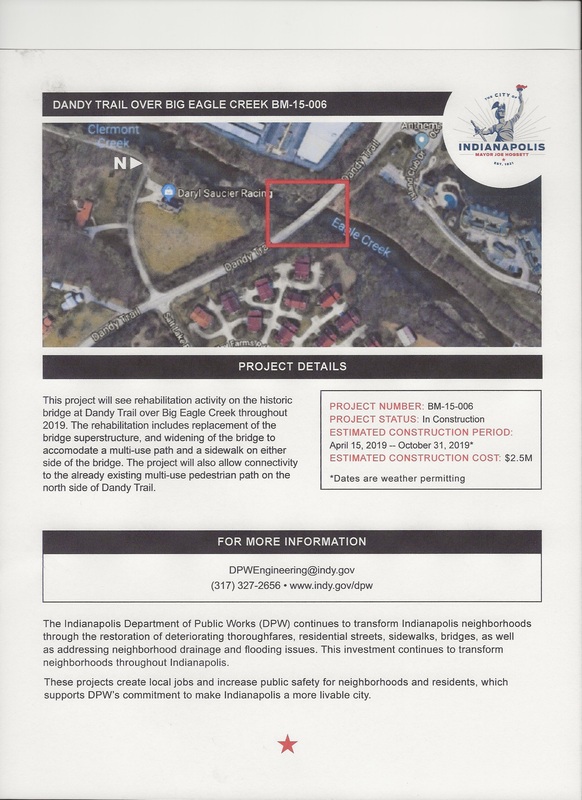 Wanted to give everyone an update on the replacement of the Dandy Trail Bridge over Eagle Creek. 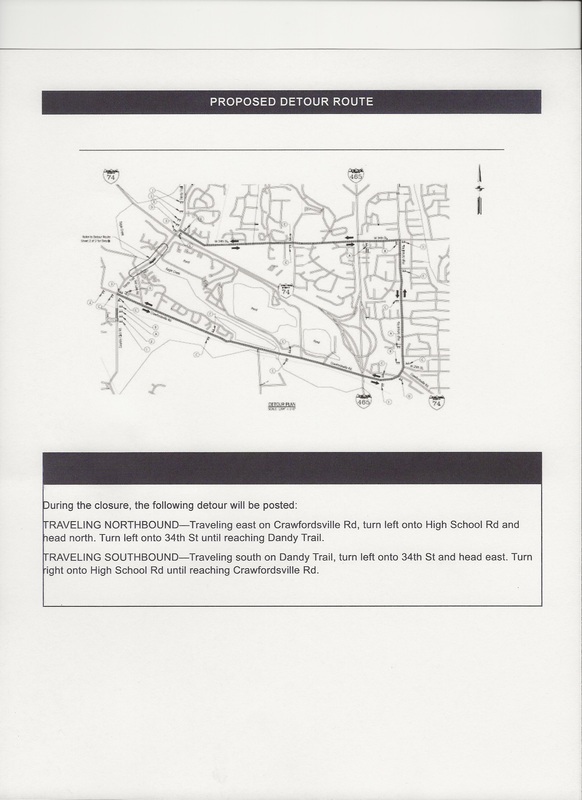 Attached is the latest information sheet that DPW has provided, which also gives the detour route. Signs went up last week, and the current date for closing will be next Monday, April 22nd. The bridge is scheduled to be closed until October 31st. We can hope for great weather, no problems, and a possible earlier opening – but they do have until the middle of November to finish if necessary. While you may not travel that way, remember that this is going to affect traffic throughout the area. The detour is using High School Road north of Crawfordsville Road and then Crawfordsville Road. This will make a huge difference in the amount of traffic that will be on High School Road in Speedway, and on Crawfordsville Road east of Dandy Trail. Also, I know that many people who live north of the bridge will also be using 56th Street to go west to either Raceway Road or out to Ronald Reagan Parkway if they are going to the Avon, Brownsburg, Clermont, or Plainfield areas, so there will be an increase in traffic in those stretches as well. Please be patient if traffic backs up along the detour, as those who travel Dandy Trail know how traffic can back up on Dandy Trail and 38th Street, especially during rush hours. Remember that this detour will also affect school buses, parents taking their children to school or picking them up, and the students in Speedway who walk to school from the apartments on High School Road. Be especially watchful for everyone walking along the detour route and for those waiting for IndyGo buses. It also will impact our emergency vehicles, who will be using different routes as well. Hope this is helpful to everyone. Please pass this information on to others that this could affect. This is not just for those who live in District 6, but for the surrounding areas and even Hendricks County, as much of the traffic that uses Dandy Trail does come from there.